Kitchen sinks are the place where your cooking really begins and finally ends! From washing veggies and fruits to finally clearing that load of dirty dishes, pans and pots, this part of your kitchen certainly gets used. It is then imperative that you spend some thought over its selection. Why choose a ceramic kitchen sink? With so many choices available, one can easily get confused. Ceramic kitchen sinks are an easy option if you really don’t want too much fuss over price, cleaning and maintenance. Ceramic kitchen sinks are also known as vitreous china sinks. These are made from a material that goes through intense heat during its manufacturing process. The color and design is also baked during this manufacturing process. Ceramic kitchen sinks are quite durable and tough. They have a hard, non-porous finish which makes them easy to maintain and clean. Although they do not require intense cleaning, harsh cleansing liquids should be avoided to keep the shining look intact. Very heavy and hard materials should not be dumped carelessly into the sink to avoid a knock to the surface. There are quite a few colors to choose from; hence you could easily match it with your kitchen color. You don’t have to bother about rusting etc as the material is homogenous. While selecting a sink for your kitchen, ensure the material is durable and long lasting. You should select ceramic kitchen sink over other materials only if you are sure about its compatibility with the kitchen styling. If you have rustic styled kitchen, you surely would not like a ceramic sink. A natural stone sink would suit better. 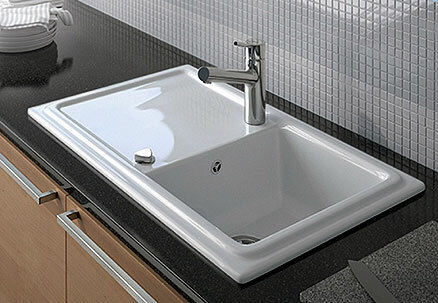 A ceramic kitchen sink is better suited to a contemporary style of kitchen. Similarly, choose the color in accordance with the rest of your kitchen’s color scheme. Do not pick up too stark and bright colors for the sink as they would attract unwanted attention. For example, a deep red ceramic kitchen sink amidst your lemon yellow or pearl white colored kitchen walls would attract attention like a red apple on a white china dish! So avoid such choices. As is the case with all the other kinds of kitchen sinks, it is important to select the right fit for the countertop hole. Otherwise you may have to go through unnecessary exchanging process or even an undesirable cabinetry work. You could take guidance from a local kitchen hardware store or search on the Internet for various models, colors and sizes available. Single and double bowl capacities are available in the market and you must choose one that suits your requirement and budget. Small kitchens cannot as easily afford the luxury of double bowl sinks as the large kitchens can. Hence consider your space requirements too while making a choice of your ceramic kitchen sink. Undermount ceramic kitchen sinks are relatively lighter as compared to a natural stone or a granite sink. However, an undermount ceramic kitchen sink is still heavier as compared to a stainless steel sink. Hence the installation needs to be firm and strongly supported from underneath. If you are not comfortable or confident of installing your undermount ceramic kitchen sink yourself, you can always consider having the contractor install it for you. White ceramic kitchen sinks are the most common. They can very well hide water marks but are prone to showing up a colored stain from a food item. Also, a white ceramic kitchen sink requires regular cleaning. Compared to this, a black ceramic kitchen sink is much easier to clean and maintain. It can sometimes show up dried water marks but can easily hide colored stains. We recently had a kitchen makeover and we had ceramic sink for our newly renovated kitchen. I also use ceramic kitchen sinks when I’m renovating houses to rent out. They are ideal because you can get a modern looking kitchen without paying too much. That means better rental profits and happy tenants. Also makes it easier to rent the house. Ceramic is a great material and excellent for kitchen sinks. Very easy to clean and maintain and very durable. I have a white ceramic kitchen sink (I like it) but I am thinking about a kitchen remodel. I think I will go black this time since it can hide stains better. My white one is prone to colored stains and is a pain to clean!